How about a smoothie face off to see which product is the healthiest? This should be fun! In one corner, we have McDonald's with their latest entry into the drink arena. McDonald's is trying to eat Jamba Juice's lunch and convince people that they are getting on the health train. They advertise that these are made with "REAL FRUIT". In the other corner, we have Odwalla, once a small company - now owned by Coca Cola - focussed on "nourishing the body whole". Both contestants weigh in at 12 ounces and they are both called "Strawberry Banana". McD's version costs $2 while Odwalla rings in at $3.50 (at my local supermarket). Ummm, hello? I could have saved myself $1.50! Geez, Odwalla, what did you do - share your recipe? 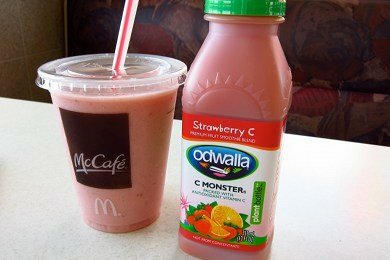 I would have expected McDonald's to really hit us with added sugar, but their smoothie has only one teaspoon more (5 grams) than Odwalla's. All I gotta do is leave a little in the cup and I have the same amount of calories with the McD's smoothie. How about the ingredients? We KNOW McDonald's has all sorts of weird stuff added to their food. Strawberry puree, banana puree, water, sugar, concentrated apple juice, contains less than 1% of the following: cellulose powder, natural (botanical source) and artificial flavors, xanthan gum, citric acid, colored with fruit and vegetable juice, pectin, ascorbic acid (preservative). Low Fat Yogurt: Cultured Grade A reduced fat milk, sugar, whey protein concentrate, fructose, corn starch, gelatin. Contains active yogurt cultures. Ice. So a major difference here is that McDonald's smoothie has yogurt and ice added. But, where are the artificial colors? McDonald's is using vegetable juice to color this smoothie! Yes, there are some weird ingredients but I am astonished at how similar these two smoothies are. They tasted almost exactly the same (I preferred the McDonald's version). Since I am a cheapskate, I will pronounce McDonald's Smoothie the better choice based on it being much less expensive. My suggestion is to treat either of these smoothies as a TREAT. The sugar content is off the charts in BOTH of them and while they are made with fruit purees - they are still not as nutritious as the fruit's themselves. Please share your thoughts on this comparison. "My suggestion is to treat either of these smoothies as a TREAT." Though, I was pleasantly surprised when I got one of the McD's smoothies a few weeks ago. When I ordered a "small", I actually got one that was small (12 oz) and not a 16 or 20oz one like I'd get at a lot of other places. Oh no! I had been so excited, knowing I could enjoy a mcd's smoothie on ice cream day. Convenient, cheap, better than an actual milkshake, seemed perfect. But good lord, they put gelatin in everything these days don't they? As a vegetarian, that is one big, unnecessary problem. I'm gonna stick with greek yogurt blended with frozen fruit, I suppose. I'll take a pass on store-bought smoothies ... I make mine at home ... no added sugar or "foreign" ingredients ... and they are delicious. This is why I prefer Odwalla's bars to their shakes. Actually, any company's bars to smoothies. So much sugar goes into anything now a days though. It's so sad. I despise McDonald's for their marketing practices. That alone will get me to drink an Odwalla. They are definitely a treat, but I have to admit I LOVE the McDonald's fruit smoothies! I don't get them very often and they are like ice-cream to me and you can order them without the yogurt, which works great for me since I don't tolerate dairy very well... so as a rare (ice-cream type) treat for me.. I love them! what about the 2g of protein and 2g of fiber that only odwalla have? that seems like an advantage to me. @Rachel - thanks for your comment. I thought about that - but 5 grams is a teaspoon so 2 grams for an entire 12 ounces doesn't seem like much of a nutritional benefit. I think it is too small to justify all that sugar. I'm not a fan of artificial flavours, myself - OR "natural" flavours. It's such a vague term that doesn't really mean anything at all. Both my kids love Odwalla too! I agree 100% to Megan Jervis' comment! I must have missed something, I see added sugar in McD's ingredient list but not Odwalla. Fructose is a bad word these days too. I see a lot of discussion on the sugar and colorings, etc. but what about fiber and protein? Without these essential elements (even if they are minor), the metabolizing of the sugar is that much more difficult. I'd go with the fiber and fewer non-essential ingredients any day. I would never eat anything from Mickey D's... but in this case, I would choose the Odwalla regardless of cost because of a. the sodium found in the McDonalds smoothie and b. the "artificial flavor" ingredient. I am also curious about what constitutes artificial or natural flavors in foods- can someone clarify? Wow, I thought I was being bad last night when I got the mango pineapple smoothie at McD's. I feel so virtuous now. If you are using real fruit, there will be fiber. Why no fiber in MCD's smoothie? and why do they need coloring? I don't think there is too much real fruit in MCD's smoothie. A half a cup of strawberries has 1.5 gm of fiber. A half of a medium banana has 1.5 gm of fiber also. Yogurt has almost 1gm of protein per ounce. So the yogurt in MCD's is virtually non-existant. Anytime you add juice, especially concentrated juice there will be a high sugar concentration. Better to make a smoothie at home with more whole fruit and less juice or have the store bought smoothie only as a treat, but I can think of much better ways to spend my treat calories. I'm surprised McDonalds isn't that bad! But I agree with Sue - I'd pick fiber and fewer non-essential ingredients any day. Also, good point that 2 g fiber for 12 oz isn't much, but more importantly: what did McD's do with the fiber? If it's there naturally and not now, my "processed" red flags start waving. McD's is so good! I like my sm00thies sans dairy so I ask for "no yogurt" when ordering.